Thera-band /resistance band curls- 2 sets of 30 reps. This will help initiate the vasodilation in the area; always have been a strong believer in the relationship of “the pump” and growth in the biceps specifically. I. 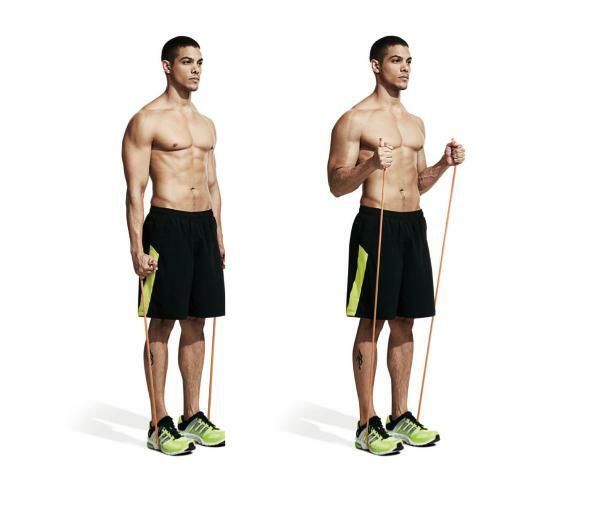 Resistance Band Barbell Curls: 4 sets x 12reps: 2-3min rests. Set-up: You will need a straight bar of some sort, a thin resistance band , and weight plates. The bar can be a standard olympic bar or a shortened bar designed for curling. Squat down with legs shoulder width and grab the band underhand at equal distances, followed by the bar. Then stand up and check the alignment. The band should be equally tight on both side. The grip should be shoulder width. Execution: Without letting your elbows move backward, curl the weight until just before completely vertical and contract your biceps. Then, lower the bar at half the speed until just before lockout to maintain tension. Do 6 reps with the bands and 6 without. Note: the band will make the curl harder the farther you curl upward, so don’t stop short. Pick a very light band. Remember, the band is to add extra tension, not to make it impossible to curl. Pick a weight to curl that is 60-70% of normal. If possible, you should ask a spotter to help you set up and take the band mid-set. If not possible, set the bar down mid-set to ditch the band before continuing. II. Seated wide angle bicep curls: 3 sets x 10 reps: 120s rest. Set-up: You will need a seated bench or an adjustable bench at the highest setting and a pair of dumbbells. Sit with your back snug against the back pad and grab the dumbbells so that your thumb is close to one side of the handle. Keeping your thumb side up, lower the weights down in an angle facing away from your body (see example pic). Execution: While maintaining the outward angle, curl the dumbbells with rotation of your wrist. You should stop curling just before complexity vertical, and aim for a solid contraction. Then, lower the weight back down at half the speed. Stop just before lockout to maintain tension; repeat. Do not over rotate your shoulders, as this can add too much stress. I typically angle my arms at 10 and 2 (on a clock). Do not completely extend between reps. This can over stress your already elongated biceps. IIIa. Cable Forehead curls: 3 sets x 12 reps: Superset with next exercise. Set-up: You will need a high cable pulley and a straight bar attachment. Stand facing the cable machine and grab the bar underhand at shoulder width. When grabbing, your arms should be sloped up with your hands level with the top of your head if the cable is set right. Execution: While bracing your core, curl the bar by bending at your elbows. The angle of your arms should not change, so no moving at the shoulders! Stop 2 or so inches from your forehead and aim for a solid contraction. Return back to the starting position at half the speed, stopping just before lockout; repeat. If the weight causes you to fall forward, try stepping back with one foot for a heavier base. This angle causes a very tight contraction in your bicep, so be wary of cramping. Do not speed through these reps, because it is easy to clock yourself in the forehead; especially if the weight is lighter than you anticipate upon starting. IIIb. Cable Reverse Curls: 3 sets x 12 reps: 120s rest. Set-up: Quickly move the cable pulley from the high in the previous exercise setting to a level near your feet. Grip the bar with hands facing down (opposite of the previous exercise). Take one step back to create extra room for cable tension. Head up, shoulders back, elbows at hips NOT BEHIND. Execution: Curl the bar until you reach a tight contraction or just before completely vertical. Then, lower the bar back to just before lockout; repeat. The curl may stop prematurely for people with bigger arms, this is okay. If you can get it completely vertical, hit your arms more! If a straight bar bothers your wrist, try swapping it for an EZ bar. Grab the bar on the outer portion if swapping. Try not wrapping your thumb for more forearm activation, or superset it with a forearm exercise if you’re a psycho. This concludes the workout. Pair with back, shoulders, and even chest.